The Prayers of Agnes Sparrow is the story of an unusual woman, Agnes Sparrow. No longer able or willing to leave her home, where she is cared for by her long-suffering sister Griselda, Agnes has committed her life to the one thing she can do—besides eat. Agnes Sparrow prays and when Agnes prays things happen, including major miracles of the cancer, ulcer-healing variety along with various minor miracles not the least of which is the recovery of lost objects and a prize-winning pumpkin. The rural residents of Bright’s Pond are so enamored with Agnes they plan to have a sign erected on the interstate that reads, “Welcome to Bright’s Pond, Home of Agnes Sparrow.” This is something Agnes doesn’t want and sends Griselda to fight city hall. Griselda’s petitions are shot down and the sign plans press forward until a stranger comes to town looking for his miracle from Agnes. The truth of Agnes’s odd motivation comes out when the town reels after the murder of a beloved community member. How could Agnes allow such evil in their midst? Didn’t she know? Well, the prayers of Agnes Sparrow have more to do with Agnes than God. Agnes has been praying to atone for a sin committed when she was a child. After some tense days, the townsfolk, Griselda, and Agnes decide they all need to find their way back to the true source of the miracles—God. continue reading "FREE Kindle Edition ~ 'The Prayers of Agnes Sparrow'"
In the Kingdom of God, each person’s destiny is the playing out of that person’s unique identity as a son of God, regardless of gender, race, or background. To embrace one’s identity as a son, one must change his prevailing culture. In this season, God is building His House in the earth, with the relationship of fathers and sons as its foundation. Effecting cultural changes requires a trans-generational effort, in which a change in the culture is but one of the first steps of a long journey to reestablish, fully, the House of God. This journey is meant to reposition man in the relationship with God as Father, as God intended from the beginning. The purpose of repositioning humankind as sons and heirs to God is to establish the family of God on the earth and to display the love of God, through his sons, to all of creation. Whereas the destiny of each son of God is vitally important, the entire purpose of God can only, ultimately, be accomplished through the corporate form—the House of God. Visit My Father! My Father! continue reading "FREE Kindle Edition ~ 'My Father! My Father!'" Paulus Valerius, former legate in the Roman army, and Alysia, the woman he loves, face danger and betrayal as they seek to spread the word of God from Jerusalem to Rome, during the maniacal reign of Gaius (Caligula) Caesar. From its suspenseful beginning to its violent and inevitable finale, this standalone sequel to "Woman of Sin" is a vivid panorama of the lives of those who choose to share the atoning power of the cross, no matter what the price. continue reading "FREE Kindle Edition ~ 'Man of God'"
continue reading "You Can Be An Agent of Change!" ~ in answered promises, realized dreams, and refreshed hope. How could we help but sing? 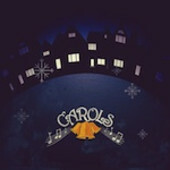 Visit Carols to pick up your FREE Christmas album! or stream the album online. continue reading "FREE Christmas Album: Carols ~ A Gift From LifeChurch.tv"
continue reading "Here Am I; Send Me!" to carry secrets far deeper than anyone imagines. Local hotshot TV personality. Ann Bannister thinks the legend of the book is a farce, but she has her reasons to join Cameron’s search anyway. Finally, there is fanatical New Age guru Jason Judah, who will stop at nothing to find the book of days before Cameron does. continue reading "FREE Kindle Edition ~ 'Book of Days'"
You can start healing today! that can make a big difference on the road to healing. one that will stand no matter what lies ahead. for those experiencing separation or divorce. They have a DivorceCare library and DivorceCare for kids. that provide encouragement and reminders of the recovery process. They also provide daily encouraging emails for surviving the holidays. LOTS of great stuff to assist you on the road to healing! 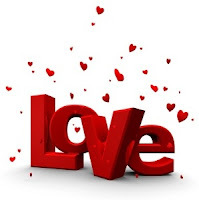 continue reading "Divorce Care ~ Help and Healing for Separation and Divorce"
continue reading "Steady My Heart ~ Kari Jobe"
Tony Cavalucci is a New York City police officer fighting for his life. The crime and corruption he sees on the job combined with a failing family life leave Tony feeling drained, lost, and frightfully alone, causing him to look for happiness in all the wrong places. Just when he is about to give up, Tony is partnered with Joe Fiore, another Italian-American cop who exudes the strength and confidence that Tony has been searching for. Though wary of his new partner, Tony finds that the day-to-day toils of his job force him to swallow his pride and look to Fiore for help. Writing with grit, freshness, and authenticity, authors Frank and Pam Lione, born-and-bred native New Yorkers themselves, bring to life the loneliness that haunts even New York's finest. continue reading "FREE Kindle Edition ~ 'The Deuce'"
proving that it doesn't take much to be the change in someone's life. Is he asking for change, or is he asking for CHANGE? continue reading "Be the CHANGE in Someone's Life Today!" This tender story about fresh starts will charm readers as all of Melody Carlson's Christmas offerings do. Full of redemption and true holiday spirit, Christmas at Harrington's will be readers' newest Christmas tradition. continue reading "FREE Kindle Edition ~ 'Christmas at Harrington's'"
by reflecting the light of Jesus. continue reading "Light Up Your World!" In this spectacular new series, Morgan, an acclaimed writer of historical and futuristic romances, turns her deft pen to the Christian market to reflect a personal change. Abigail Stanton, who recently lost her husband and child, moves to Culdee Creek to become a housekeeper for Conor MacKay, a man whose previous housekeepers warmed more than dinner. Abby makes it clear that she won't tolerate any disreputable advances on his part, but she feels God led her to this ranch and this family for a purpose. As she grows to love Conor and his daughter, her faith inspires Conor to believe that there might just be something to this idea of religion. This wonderful start is for all collections. continue reading "FREE Kindle Edition ~ 'Daughter of Joy'"
continue reading "Unredeemed ~ Places Where Grace Is"
And you can SAVE 20% off everything in their store! It contains Monthly Goals Planners that guide you to set and plan your goals for the month, Daily Priorities Planners that help you focus each day on your top priorities first, plus Goals Lists for the current and next year, and a record of Goals Achieved And Rewards. It’s a simple but powerful approach that helps you to spend your time where it counts most, and to have more time for the goals that genuinely matter to you. The Goals and Priorities Diary is FULLY INTERACTIVE – you can type, save, search and edit. Save it to your desktop so you’ll be reminded every morning to open it up and get to work on your goals and priorities. You can even view your Goals and Priorities Diary from your iPhone or iPad. Or print it out and write in it, if you enjoy the feel of using pen and paper. Organize Your Life. Achieve Your Goals. Be Your Best. you NEED to pick up the Goals and Priorities Diary 2012. All the details are at the link...let me know if you pick up a copy!!! and starting to plan for next year! continue reading "Goals and Priorities Diary ~ Limited Time Offer"
and gives a rest of heart." Special thanks to Victoria Gaines for sharing! continue reading "Seeing Our Father in EVERYTHING"
this app is a great way to start! and share your joy while it is happening. as well as share your 1000 gifts on Facebook, Twitter and Flickr. 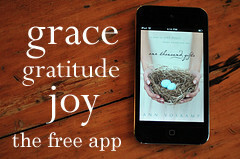 continue reading "FREE App: One Thousand Gifts by Ann Voskamp"
Eleven-year-old Sarah Stone is lonely in a mansion amidst butlers, nannies, housekeepers, and a father who is too busy for her. She is angry at the world. On the other side of town, in a slum called the Sink, Jared Roberts and his gang barely survive broken families and a hardscrabble existence. Jared, too, is angry, and intends to do something about it. He eyes Sarah's mansion for a pre-Christmas burglary that will show the world who he really is. Into this mix comes a mysterious little man named Nicholas, who intrigues, yet scares, Sarah and Jared. Against incredible doubt and cynicism, Nicholas tries to guide the two youths away from their anger and the suffering that will follow, only to realize he can not move them. Finally, he whisks them to another time and place where a Christmas long ago teaches them the true meaning of life in a way they never imagined. MARY'S SON is a modern tale of the fears and passions of youth overcome by the wonder of the real Christmas story. continue reading "FREE Kindle Edition ~ 'Mary's Son: A Tale of Christmas'"
continue reading "I Heard the Voice of Jesus Say..."
What is in Your Hand? 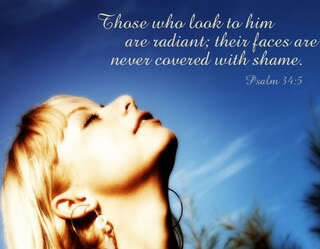 Learn how God uses ordinary people and thingsto accomplish His EXTRA~ordinary purposes!!! God wants to do EXTRA~ordinary things through you!!! continue reading "What is in Your Hand?" and it will affect everyone at some point in their lives. or you may know someone who is. wriiten by Melinda Todd from Trailing After God. In 31 Days of Depression, Melinda shares exactly what depression is, healthy ways to combat the darkness and she also openly shares about her own personal testimony of how depression has affected her life. Day 1: Warning! I Don't Care! Day 4: Can I Be Depressed and a Christian? What I liked most about this series is that Melinda spreads the information out over 31 days. She gives you a topic to chew on, as well as time to implement what she has shared. it is NOT intended to be professional or medical advice. and I believe she has done just that!!! 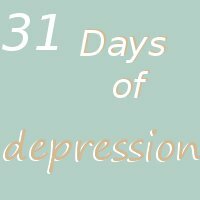 Visit 31 Days of Depression to be encouraged!!! continue reading "31 Days of Depression"
and quiet the fears of the anxious heart. continue reading "What Love Can Do!" Take a Christmas break and sit down with pastor and best-selling author Adam Hamilton as he guides you through a four-week devotional based on the most joyous event in history. Created for individual use or as a companion to the primary book, The Journey. continue reading "FREE Kindle Edition ~ 'The Journey: A Season of Reflections'"